Before I took on the challenge of ginger snaps, I took a stab at re-creating one of my favorite cookies, Archway's molasses cookies, which I love, but will no longer buy, and would not buy even if they hadn't perverted that beautiful round shape with those stupid petals. They were soft and spicy and, other than the Dutch Windmills of which I have fond childhood memories (and which, the last time I tasted them several years ago, were nothing like my memory), the only Archway cookie that I would buy. The last time I went looking for them I could not find them, nor could I find any Archway cookies on the shelf. A quick internet search confirmed that they had, indeed, closed in 2008. I was mildly disappointed, but was already not buying very many processed foods so it was not a terrible loss. I later discovered that Lance was buying the company so the brand was revived, but by then I was to the point where I basically could not put anything in my shopping cart that had HFCS, transfats, or chemicals in it. So I decided that it might be interesting to see if I could find a recipe. I found two recipes, both in Nick Malgieri's Cookies Unlimited. I have found the recipes in this book to be hit and miss, and this experience kind of highlights that. The first recipe was sounded like it might be the recipe for which I was searching, but it turned out to be a disappointment. The cookies, pictured left, were hard and smooth and tasted more of flour than molasses. I had not yet found my molasses cookie. There was also a soft molasses cookie recipe in Malgieri's book, so I decided to try that. The result, pictured above, was also disappointing to me when I pulled them out of the oven. They were too soft, and too puffy, and had a cake-like texture and they also didn't have much of a flavor outside of flour. But I liked them well enough to take them to work and let the guinea pigs my co-workers taste them. And to my surprise, everyone liked them. 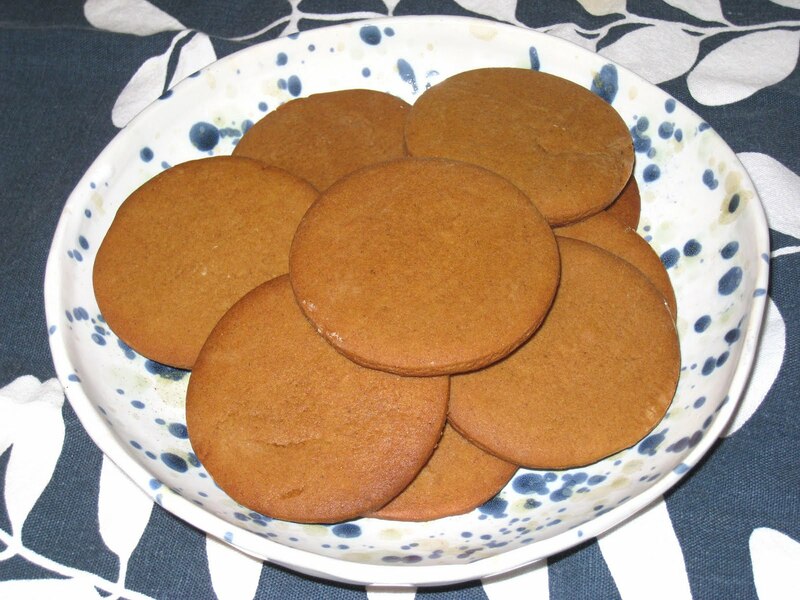 Some liked the ginger snaps much better, but there were a few who actually preferred these. And I must say, like gingerbread, after a few days they tasted much better. The texture got a little heavier and the molasses flavor got stronger. There was one more recipe I had earmarked to try, from Tish Boyle's The Good Cookie, but when I read it over I realized it was basically a ginger snap. 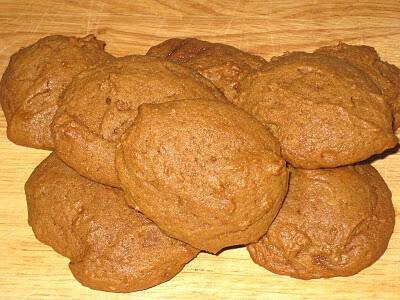 So I think I will let go of the search for the perfect molasses cookie (it was probably the chemicals and preservatives that made it so soft and chewy anyway) and go with the ginger snaps when I want a crispy, crunchy snap, and the soft molasses cookies when I want something a little softer. I have not been the biggest fan of Cookies Unlimited, especially when measured against The Good Cookie, but in all fairness I should say that I have found some good recipes, that I will make again. This is one of them. Set two cooking racks in the top and bottom parts of the oven and preheat the oven to 350 deg. F.
Combine the flour, baking soda, salt and spices in a large bowl and whisk together until completely blended. In a different bowl, using cream together the butter and the sugar. You can use a stand mixer, a hand mixer, or good old elbow grease to do this. Add the egg and beat until the mixture is smooth, then add the molasses and beat that into the mix. water and the rest of the dry ingredients. Make sure the dough is well mixed. the paper onto a rack to let them cool and then take the cookies off of the parchment paper. I think I need to try these, using butter instead of shortening. Lynn, that recipe is very close to the Ginger Snaps recipe I posted here. It was probably the grandparent of all these other recipes you can find on the net these days. As I mentioned in that post, we did a test of shortening vs. butter, and the butter makes for a flatter, crispier cookie, which most people liked better. I also tried it using just oil, which made for a really greasy dough, but did not spread out as much as the butter cookies. They're all different but they're all delicious!